Hope for the World was organized to bring hope to hurting people. Hope for the World Is working with nationals to help educate people and to meet their humanitarian and spiritual needs. Our mission is to reach the remote tribes of India. Love is the heart and soul of Hope For The World. 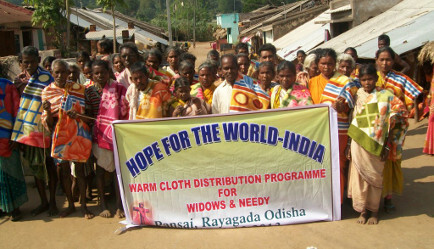 We are reaching out to help needy families and widows. From the beginning, the desire for Hope For The World has been to make a difference. Our focus is on meeting the physical, spiritual, mental and emotional needs of children. We care for the children by providing food, clothing, and shelter, and by educating them in a loving environment. We not only just keep them alive, but teach them how to live. Our goal is to let them know our love for them and to give them a hope for the future. Copyright © 2015 Hope for the World India. All rights reserved. Site design and hosting by dscTech, Inc.